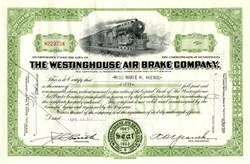 Beautifully engraved certificate from the Westinghouse Air Brake Company issued no later than 1951. This historic document was printed by the Security Banknote Company and has an ornate border around it with a vignette of train passing with mountains in the background. This item has the printed signatures of the Company's officers and is and is over 59 years old. Originally organized in 1869 to manufacture the air brakes invented by George Westinghouse, the company moved to the larger and more modern plant featured in the AM&B motion pictures in Wilmerding, PA, in 1889. The works for this plant comprised over nine acres of floor space. The works and the yard together occupied approximately thirty acres. In 1905, approximately 3,000 workers were employed, and the output was 1,000 brake sets per day. The first air brake invented by George Westinghouse revolutionized the railroad industry, making braking a safer venture and thus permitting trains to travel at higher speeds. Westinghouse made many alterations to improve his invention leading to various forms of the automatic brake. 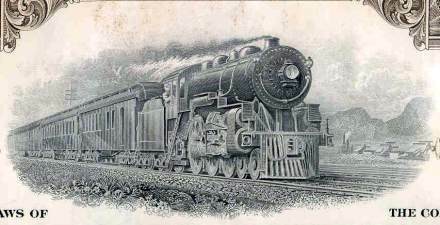 By 1905, over 2,000,000 freight, passenger, mail, baggage and express cars and 89,000 locomotives were equipped with the Westinghouse Quick-Action Automatic Brake. In addition, the company manufactured equipment necessary for brakes, such as a friction draft gear, and also evolved from making the air brake to manufacturing an electro-magnetic brake. The town of Wilmerding, popularly known as "the home of the air brake," became centered around the workings of the Westinghouse Company, as its fortunes rose and fell with that of the company. The Westinghouse Company even built houses for its employees and buildings for town activities. The Westinghouse Air Brake Company eventually expanded into foreign areas, opening factories in London, Hanover, and St. Petersburg.